We are Car Hire Brokers who specialise in Spain. We offer our clients hassle-free, discounted car hire with an emphasis on client protection. Our family run business means that we can give a personal service to our clients. We have clients from all over the world come to us for our service and our low prices. We have been using the same supplier in Spain for over 30 years who offer latest model cars, a wide choice of vehicles and a first class airport based service. No advance payment or deposit required. Our clients pay for their hire car when they collect in Spain. 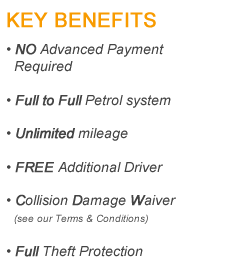 Our prices include one additional driver, unlimited mileage (apart from Group G2 where mileage is limited to 2,000kms per hire – extra charge of 0.20€ per km thereafter), replacement car in case of accident, personal accident insurance, compulsory CDW with excess, theft of vehicle cover (except when keys are left in the car), public liability cover and all taxes. We operate what we believe to be the only fair petrol deposit system. You are asked to leave a deposit for a full tank of fuel, which is refunded providing the car is returned full. (Many companies 'over-charge' for a full tank and then ask clients to return the car empty).